Most students acquire a cursory understanding of human anatomy in science class, but in our International Middle School, we design our curriculum to push our students to go further and achieve deeper understanding. Our 7th grade robotic arm project is a great example of this approach. 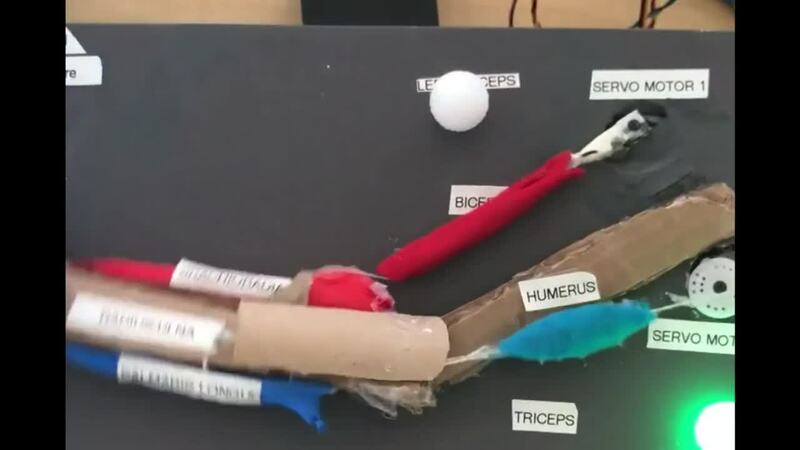 This unique project was devised by Middle School Design Teacher Elisabeth Lepert, and combined skills from multiple disciplines – science, design, robotics, and computer science. First, students learned about muscles and how they move and react to stimuli in science class. 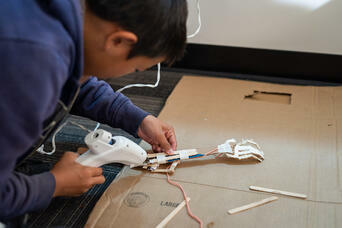 Next, in design class, they were challenged to create a working model of a human arm. The arm would have to be both anatomically correct and able to recreate a reflex reaction, moving in response to a stimulus (such as how you would retract your arm if you touched a hot stove). 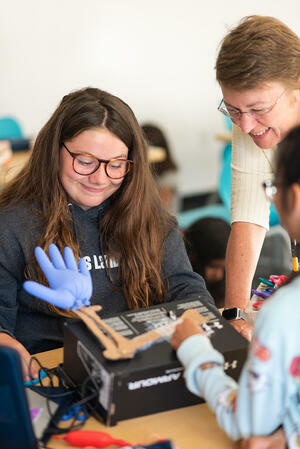 Students had the freedom to construct their models from whatever materials they thought would work best – they used cardboard, plastic, balloons, felt, rubber gloves, and more. They attached strings to small servo motors and connected them to the muscles and bones to simulate muscle movement. Students used their computers to program the servo motors to work together with a sensor so that the arm would contract when the sensor was triggered.